This Miso Tomato with Roasted Garlic and Shichimi Tograshi is inspired by a Miso Tomato Soup recipe I saw a couple of years ago. I still intend to make the Miso Tomato Soup with homegrown tomatoes, or even tinned cherry tomatoes, but at the weekend I was inspired to mess with it a little and make a thick sauce for pasta salad. I still have a jar of brown rice miso in my fridge, as for the ShichimiTograshi - well I picked that up last year when we went to Glastonbury. Shichimi Tograshi is a Japanese condiment made up of red chili peppers and other spices like black and white sesame seeds, tangerine peel and nori flakes. I want to do more with the Shichimi Tograshi, so if any of you have any suggestions they will be most welcome. 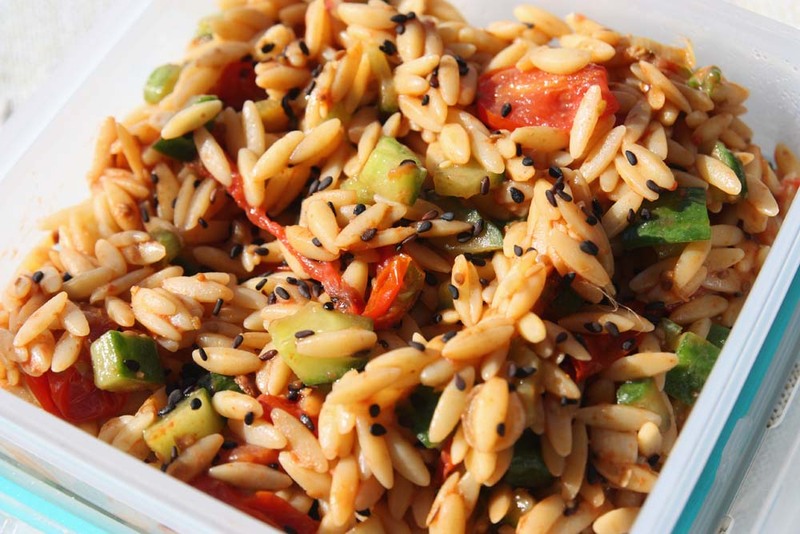 I am sharing the Miso Cherry Tomato and Schichimi Tograshi Orzo Pasta Salad with Soups, Salads and Sammies hosted by Kahakai Kitchen. 250g - 300g orzo, cooked according to packet instructions, set aside. In a bowl, add the garlic and sliced cherry tomatoes. Whisk together the tomato paste, miso and olive oil and then pour over the garlic and tomatoes and toss well. Then transfer to a baking sheet. Roast in the oven for 15 - 20 minutes or until the tomatoes have burst. Squeeze out the garlic and discard the papery skin, then transfer to the bowl along with the roasted cherry tomatoes. 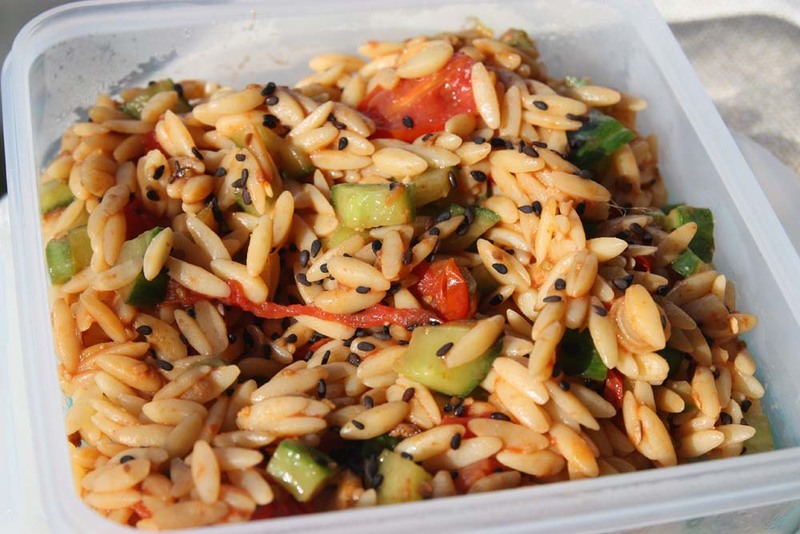 Stir in the cooked orzo and remaining ingredients, including the optional black sesame seeds. Taste and adjust seasoning if necessary including Shichimi Tograshi. Serve warm or cold. Inspired by a Miso Tomato Soup recipe by Gourmande In The Kitchen. I'm a huge fan of orzo salads. There's something about the first rays of sun that makes me want to just dive into orzo. I can totally see the happy marriage with togarashi and miso. Thanks Joey, yes I can see why orzo may appeal on sunny days. Hi Shaheen, this sounds lovely. We used to go through shichimi togarashi by the jar a few years ago, I must get some more! Thanks Lucy. If you have any further suggestion regarding suggestions and ways to use tograshi, please do let me know. This makes me think of the M&S orzo pasta salad with tomatoes - but yours is much better and has a far more exciting ingredient list. Thanks for the idea, what a great summer lunch. Off topic, but on your comment about chickpea scramble, I greatly disliked scrambled eggs too so don't let that put you off :-) In fact, I found tofu scramble more like eggs than the chickpea flour equivalent. Thanks Deb. I hope to join in this week too with another salad dish, its proper hot here in the UK.